Influence is a necessary ingredient in today’s world. The Influence factor is the primary DISC factor that deals with relationships, communication, interactions, and every day we put our influencing skills to the test, whether they are working for us the way we need them to or not. Situations may come during group settings or one-on-one contact where your current level of influencing ability is inadequate. 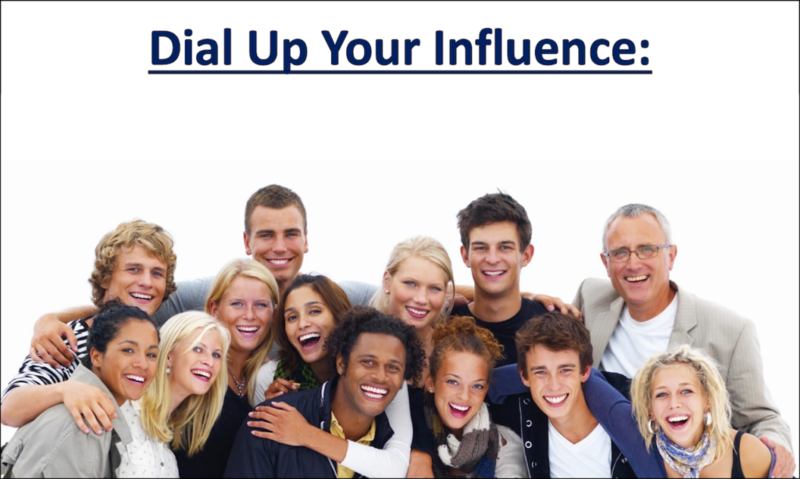 Dialing up your influence powers will make you better able to make sure that others buy into your ideas and put them into action. When you are able to dial up your influencing aptitude to an appropriate level for situations you face, you make your work, family, or social life change for the better. In this session, we’ll concentrate on giving you tips and tactics to enhance your influencing skills. There are several benefits of an elevated Influence factor. One important reality is that it might give you the ability to instigate change. We need to be able to deal with change in order to operate effectively. More than that, relationships with other people are constantly changing so being able to maneuver during changing times is important. Being able to influence the changes in your relationships; in your workplace, family life, and social life is important for your overall wellbeing. This ability to impact change is closely related to goal achievement and leadership, too. Moving forward and getting things accomplished means that you have to constantly change – moving from where you are right now to where you want to be in the future. Leading people toward a goal efficiently and without a good deal of stress demands a heightened level of influence. Even though you were not born with this natural ability, you can most certainly become proficient at communicating well and presenting ideas that people will buy into and follow. Another important benefit is that by an elevating your Influence factor you can be particularly effective in building and maintaining rapport with others. Rapport building and trust go hand in hand. Especially if you have been working with the same people for a while you’ll find that if you don’t regularly reinforce the Influence factor, team spirit or motivation may suffer. In your personal life, if you’ve been in a relationship over a long period of time, you can become complacent about how you interact with them. If you bolster your influencing talent on a regular basis and keep communication channels open by listening and paying attention to what’s important to those you care about, you’ll make certain that you won’t lose interest in one another or become irritable toward them. In the DISC world, the Influencing factor revolves around a desire to interact with and understand people. Being able to dial up this important function is critical. You can start to dial up your influence by taking some immediate steps to practice using the influence factor in your everyday work and personal life. If you do not have a naturally elevated Influence factor, you may have to step outside of your comfort zone to realize the full potential of this factor, but it will be worth it when you see what it can do for you and those you interact with. Your subconscious mind is an extremely powerful and largely untapped resource that has the ability to think in the past and future as if it were happening in the present. The subconscious mind holds control over how you see yourself and your future. Unfortunately, most people don’t understand that their subconscious mind is theirs to control! When we let our mind wander and dream or imagine the future that is our subconscious mind directing us. So, wouldn’t you want to fill your subconscious mind with as many positive thoughts as possible? Positive self-talk is how you harness the power of your subconscious mind and direct it on the path that you want to go. By controlling the dialogue that goes on in your head, you are able to control how you act and feel. If you think you aren’t a very good communicator it’s going to be hard to have the confidence to talk to people. What if instead of saying to yourself “I’m a terrible public speaker”, you say”I am amazing myself at how quickly I am becoming more comfortable speaking in front of people because I am willing to learn and try it.” Quite a difference isn’t it! Whatever we tell our subconscious is what we will feel and how we will act, so be positive! It is shocking how many people talk themselves down in their own mind and therefore put a harness on their potential. Positive self-talk is extremely important in life and especially in areas where you might think you aren’t quite as successful. Learn to recognize when you are using negative self-talk and change it. Our possibilities in life are endless, but unfortunately, too many people hold themselves back by telling themselves they can’t do something, or they aren’t good at that. Learn to control your self-talk and create a positive subconscious mind and as it becomes a habit you will notice that you are constantly energized and encouraging yourself to pursue your goals. Review Session 6 of the Life Skills Part 2 course to better understand how you can change your negative self-talk to positive, encouraging self-talk. Look on the bright side of things and ignore the negatives. Ask yourself a double-barreled question (and be realistic when you answer): What’s the worst that could happen and what’s the probability of that happening anyway? Most of the time you’ll probably answer that even the worst thing isn’t probably going to happen and even if it does, you can handle it. As soon as you put your fears into perspective with this line of self-questioning, you’ll be surprised at what a positive impact his can have on your attitude. Happiness and excitement are magnetic and spread like wildfire. The happier you are, the happier everyone else around you will be. Just having a smile on at the office can improve the morale of people working around you. People will instinctively mirror your personality when they are talking to you. This is an excellent way of dialing up your Influence factor. You have more control of conversations if you realize that your body language speaks louder than words. Being able to have enthusiastic body language will cause others to mirror you, making them feel better when they are around you. These good feelings help to build relationships and ultimately build trust. When you need to dial up your influence, there is no better way than ramping up your enthusiasm. It will help you become more extroverted and it will cause you to talk to more people. As you continue to do this, you will learn to build your confidence, just like Teddy Roosevelt. This will take practice and a conscious awareness of people you are conversing with. Mirroring and matching, allows you to build rapport with another person through your body language and vocal qualities. As humans, we naturally feel comfortable with other people that have similar body language to our own and those who communicate like we do. If you can use that knowledge to gain rapport with others, you will find yourself with a masterful advantage in business relationships and you can effectively use it in your family and social relationships, too. If you can successfully mirror and match other people’s body language, people will like you more and open up to you more. When done effectively, this skill will help so to that you will, in turn, have a better understanding of people. When you’re going places such as lunch or grabbing a coffee, invite your coworkers with you or ask if they’d like you to get something for them. They will be flattered that you thought of them and may come along for the company. Initiations have a profound effect on relationships. People are honored when you think of inviting them to join you. It doesn’t have to be something fancy or formal, it’s flattering to know that someone liked you enough to invite you to spend some time with them. Remember that simple gestures like this around the office, with your family, or with your friends is a great way to build relationships. You will learn more influencing skills this way because of the personal interactions you will have. This is the best way to learn about behaviors. When you find out something new, share it with the people around you and your team. Make sure everyone is on the same page and has the up-to-date information and knowledge. The influence factor helps to build cohesive team units by making sure that everyone has the knowledge base required to make them successful. The better you are able to help other people understand all of the information involved in a project or undertaking, your team will run more efficiently and with better results. Sharing knowledge can sometimes be against a person’s first inclination because they might buy into the old saying that ‘knowledge is power’ but don’t understand that it is not as powerful if you don’t share it. They might want to feel in control of situations by controlling the information flow. Unfortunately, some believe that if you give the information away, another person might be able to take over their superior knowledge-based position. If someone does believe this, they should change their thinking and realize that when you are working on a project, you must give a team member all the information they need to get the job completed. Otherwise, there will be a lack of team unity and the project will end up worse off than it could have been. So, holding onto knowledge in instances like these is detrimental to the whole. Plus, on a personal level, it is bad for you. You lose your influencing edge if you have the information but refuse to share it. People aren’t stupid. They’ll soon figure out what you are doing, and they will work out ways to make sure that you don’t get into that sort of powerful position again. They can go around you and get the information elsewhere. Or they can make decisions without your input, which is bad for many other reasons. For all these explanations, make sure that you don’t make the influencing mistake of holding onto information. It might be a short-term gain but in the long run, it hurts more than it helps. If the option comes up for you to work on a team, take it. Work with as many people as you can and connect with them. Get everyone together and start everyone working towards a common goal; you’ll feel your influence increasing and it’ll be easier to get to know and work with new people. As you become more experience in working with teams, you will begin to realize how to find a common goal for everyone to work toward. Then you’ll understand how to link that goal to each person’s motivators in the team. As you practice this step and get better at teamwork, you might begin to see yourself becoming a true leader – someone dedicated to helping bring people closer to achieve their goals. After trying out the immediate steps, there are some secondary steps that you can take to dial up your influencer factor. This is a secondary step because it is more advanced than the immediate steps because we are going to use a technique that is designed to make you overcome a natural fear of approaching new people. If you don’t naturally take the time to get to know people, look around your office or department. You’ll soon find out that although you talk to people if you’re like almost everyone, it’s probably the same people almost every day. To up your influencing abilities, make it a point to talk to people that you don’t know very well. These may be new people or those you’ve worked with before but haven’t taken the time to get to know beyond a surface level. Introduce yourself and strike up a conversation. The more social you are with them, the more social they’ll be with you. The goal is to systematically put yourself into conversations that might at first seem uncomfortable because getting to know people can be just that. However, the more practice you have at being uncomfortable, the less uncomfortable you’ll feel. This process is called systematic desensitization – where you methodically, systematically desensitize – through repeated exposure – and build up your resistance to feeling awkward, stressed, embarrassed, or any other negative feelings when you talk to people. Remember, the first few times you do this, it might not go very well, or it could go great. You never know, but the point is to get out there and just do it. Don’t expect everyone to love you, but rather look at it as a game of numbers. The more people you talk to, the more you put yourself out there, the more you are building up your influencing abilities. The bottom line: You should be able to take a genuine interest in the people that you interact with every day. Everyone can teach you something that will give you better skills or knowledge to handle situations better the next time. You will learn influencing skills as you continue to learn from other people during conversations. While you work, especially if you are working alone, get help from your peers or solicit input from others. Have them review your work or have an informal meeting for them to look at it. Just run ideas, past people. You’ll be pleasantly surprised at how much this can dial up your Influence factor. They will be glad to give input into your situation and will often see something that you missed. Therefore, they will help you twofold, by first catching mistakes that you overlooked and second by helping to foster a better relationship between the two of you. It is not often thought about how helpful working together and get another person’s opinions can help to produce stellar relationships between people. When you’re trying to get your point across, first remember the lessons from perceptual positioning. To gain an influencing advantage, you have to target their perceptual prism and only then move them into your way of thinking. If you forget to think about how they currently think before trying to influence them, you are fighting an uphill battle during the influencing process. After you have acknowledged what the perceptual positions are in the situation, use your verbal skills to put together a compelling argument. Don’t forget to use mirroring and matching through verbal and body language cues. In this way, you will be much better able to convince others around you. I suggest that you practice your speaking skills prior to launching them in front of a live audience if you are not yet competent in this area. This is wise even if you are delivering an influencing pitch to an audience of one. You can do this by talking in front of a mirror or by rehearsing what you plan to say while you’re in the car. Keep replaying objections and counter-arguments in your mind until you have a persuasive answer for them. After you continue to practice this, you will become much better at influencing people. Remember that sometimes people will persuade themselves if you know how to influence them to talk. A story is often told of a man who owned an elephant. He found the elephant to become too expensive to maintain. One day, he approached a friend with a proposition: â€œI am putting my elephant up for sale. It is only five hundred dollars. Do you want to buy it? If you influence people to talk, they will often convince themselves in unexpected ways. Let others talk and input key information and you will be surprised by the lengths they will go to persuade themselves for you. This may be your worst nightmare, but if you don’t practice it, you won’t ever become good at it. You’ll find that when you practice getting up in front of a group enough, it becomes easier and less frightening. This is another area where systematic desensitization has proved highly effective. Start with one or two people in an informal setting and methodically build to a point where you are competent at speaking in front of anyone, anywhere. And remember, you might never completely overcome your fear of speaking in front of people. That’s okay. To those of you who know this is true for you, I’ll give you this advice: Feel the fear but don’t let it stop you. It’s ok to feel the fear, just so long as you do it anyway. People are generally good-hearted and do not disparage a person for speaking in front of a group. Think about your attitude to people trying to speak. Don’t you cut them a bit of slack? Sure, you do, and people will do the same for you. As long as you try your best, have something to say that they find interesting or helpful, you’ll do just fine. So just get out there and practice. Whenever you have a company fundraiser or a business gathering, try and get your name on a list of speakers or address smaller groups that you are comfortable with. Remember, in the human brain, four is a crowd. If you can practice in a small setting and gradually work your way up, you will find that speaking becomes easier and you’ll get better at it. If your goal is to dial up your influence factor to the optimum level, make sure you complete the activities in the activity section. I hope you have enjoyed the steps on how to dial up your influence factor. Be sure to incorporate each of the four primary factors into your life as the situation warrants. Behavioral flexibility is the key to your success.